The Selby coalfield also led to the expansion of Ferrybridge power station and also the supply of locally mined coal to Eggborough power station, near Knottingley, which is roughly half the size of Drax. the last coal-fired power station to open in the UK. After the Selby coalfield closed completely in 2004, the three power stations switched, in the main, to burning imported coal that arrived by rail from Immingham, Hunterston and Tyne, along with opencast coal mined in Ayrshire. Although Drax is marginally closer to the Ouse, it was dubbed one of the Aire Valley power stations along with Eggborough and Ferrybridge. After several changes of ownership from CEGB days, Drax has been operated by Drax Power since 2005, and is part of the Drax Group, a company listed on the Stock Exchange, headed up by CEO Dorothy Thompson. As is well-known, UK electricity is generated from coal, gas, oil nuclear and biomass, but it was growing concern over carbon emissions, not just from power stations, that focused attention on how emissions could be reduced nationally. The first tests on burning biomass were carried out at Drax in 2004, when 14,000 tons of locally sourced willow was burnt. Biomass is biological material obtained from living or recently living plant matter – forest residues, dead trees, branches and tree stumps – that can be processed and used to create electricity, fuel and heat. Biomass has been used for thousands of years and comes in many forms. The materials that Drax use include sustainable forestry and forestry residues; residual agricultural products, such as straw, sunflower seed husks and peanut husks; and purpose-grown energy crops. The material is processed and compressed, and the finished product looks like a brand of cat litter! In 2009, Drax submitted a planning application to build a 300MW biomass energy plant next to the power station, and although the scheme gained Government approval, Drax dropped the plan in 2012 due to costs and uncertainty over Government financial support. Drax had also been looking at carbon capture systems for many years, and even though such schemes were not commercially viable, in July 2012, the company said it would begin the process to convert three of its six coal-fired boilers to burn sustainable biomass. The first biomass unit came on stream in April 2013, with a second coal-to-biomass conversion being completed in October 2014. The third unit came on stream last year. One of the key differences between pulverised coal and biomass is that coal will still burn if it is wet. If biomass gets wet, it is ruined, hence all the precautions needed to keep it dry. So, even before the first rail movements began from the Port of Tyne in 2010, which were contracted to GB Railfreight, special air-operated doors had to be designed and fitted on the top of former coal hoppers, which protected the biomass from moisture. At the Port of Tyne, one of three sites where biomass is imported, special handling and storage systems had to be built, representing an investment of around £100million. Because of the quantities of biomass that needed to be burnt each year – around 7.5million tons – new unloading, storage and conveyor systems were needed at Drax too, and these were opened in December 2013. However, to feed three furnaces with so much biomass, you need a reliable, flexible and solid supply chain, so I paid a visit to Drax to find out more and how rail was instrumental in that chain. The power station is on a 2,000 acre site, with high fences topped with razor wire and CCTV monitoring. Security is taken very seriously, more so after a protest in 2008 that halted trains. The plant has its own security force which regularly patrols the perimeter and local roads, plus its own ambulance and fire engine. At the south end of the site, access to the power station is by a pair of twin tracks running for 4.5miles from Hensall Junction on the Knottingley to Goole line. After passing under the A645 road, the two tracks split into four – two serving the biomass discharge shed and two for coal discharge. These four tracks continue around the site, merging again to head off back down the branch. At the north end of the site are sidings for transfer of flyash and gypsum, which can be carried out without interruption to the flow of biomass trains. As mentioned previously, the supply chain is critical to the whole process, and the majority of biomass burnt by Drax comes from North America, where there are extensive forests. Biomass is also supplied to the power station from Canada, Latvia and Estonia, all moved by rail in the UK. In the USA, the raw product is transported to one of two processing plants owned and operated by Drax Power – the Morehouse plant at Bastrop, Louisiana and the Amite plant at Gloster, Mississippi. Both plants are located in areas hard-hit by recent consolidation in the pulp and paper industry, resulting in a surplus of low-value wood from timber harvesting operations. Both sites were commissioned in August 2015 and Drax has even set up a biomass HQ in Atlanta. 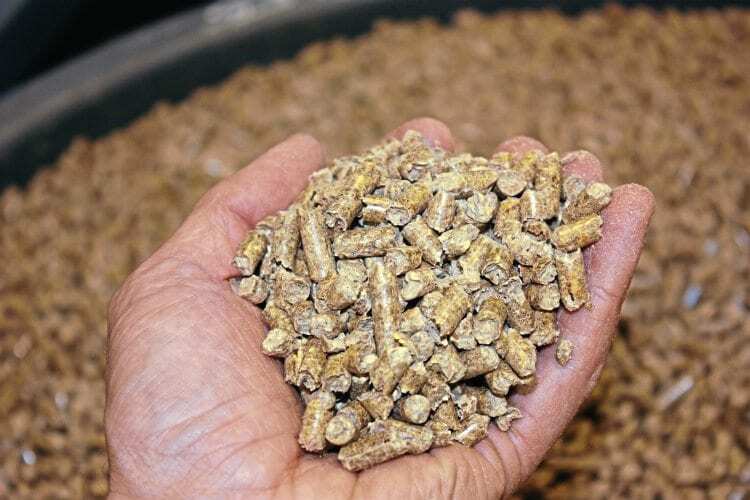 At both plants, the biomass pellets are produced almost entirely from southern yellow pine, locally sourced from small and large landowners in Louisiana and Arkansas. The Bastrop plant despatches 30 wagonloads every day on a 200-mile journey – with haulage contracted to Union Pacific – to a specially built shipment facility at Baton Rouge, on the Mississippi river, where there are storage facilities for 80,000 tonnes of biomass. The two plants can produce a combined output of 900,000 tonnes each year. Creating the facility at Baton Rouge brought an old rail yard back into use, led to a public jetty being upgraded, and the spinoff has been the creation of other new businesses, all stimulated by Drax. Baton Rouge, which also takes pellets for Drax from a third-party supplier, was chosen for shipment as it is the closest deepwater port to both plants that can accept ‘panamax’ class cargo ships that have a capacity for between 65-80,000 tonnes. Because biomass is a volatile cargo, the ships have to be fitted with CO2 suppression systems. These vessels dock at either Liverpool, Immingham or the Port of Tyne, each location having storage facilities. Tyne can store 70,000 tonnes, Immingham 200,000 and Liverpool 100,000 tonnes. Hull can be used as a back up too, but has a smaller capacity of 30,000 tonnes. Onward movement to Drax is by rail. GB Railfreight has two contracts with Drax, one for moving biomass from Tyne, and the second (which began last year from Liverpool), linking with a shorter sea crossing. The third contract is with DB Cargo, which handles biomass imported to Immingham. Because the supply chain is so critical, in a back office at the power station a team controls the flow of biomass. Monitoring usage and what is in store, they are in contact with the shipping companies and can ask them to speed up or slow down as appropriate, and could even change destination port. The North Atlantic weather plays a key part in this monitoring to ensure on-time deliveries. Britain’s Victorian rail infrastructure is undergoing vast modernisation, and having a choice of route from the west or east coast ports to Drax means that a minimum of one option is always open should disruption occur, thus ensuring continuity of supply. 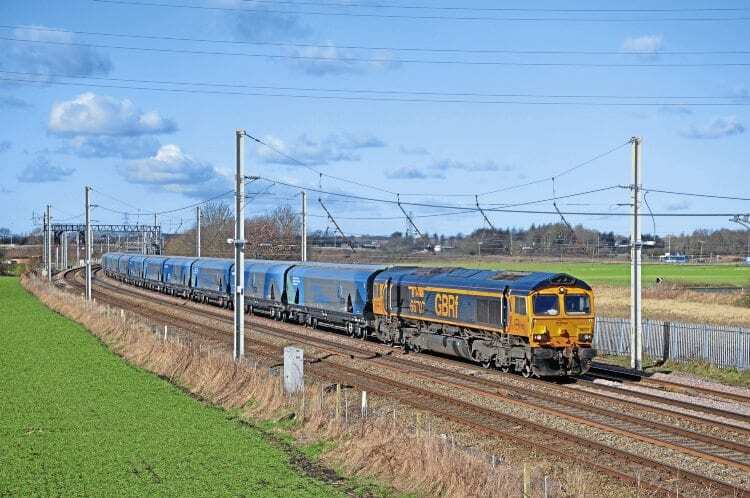 When the resignalling of Barnetby and North Lincolnshire took place last year, there was a 10-day cessation of biomass trains from Immingham, Tyne and Liverpool, stepping up capacity. While the punctuality of the ships carrying the biomass can vary, the rail timetable is far more precise. Looking at each rail route, from Liverpool there are up to three working timetable (WTT) paths on a weekday, which will increase in time, five variable paths from Immingham, and a couple from Tyne. Liverpool trains travel via a very circuitous route to Drax, running through Earlestown, Warrington Bank Quay, Acton Bridge, Northwich, Stockport, Denton, Ashton Moss Jct, Todmorden, Healey Mills, Pontefract and Knottingley, the schedule being around six hours. The Immingham service is also slightly circuitous, running via Barnetby, Hatfield & Stainforth and Knottingley. In contrast, the Tyne services are less complex, running via Sunderland, Stockton and Yarm, then the ECML to Colton Jct, before being routed via Church Fenton, Milford Jct and Knottingley. It can be a very fluid situation for deliveries; during my visit both coal and biomass trains arrived, demand for either being driven by the power station’s requirements. Because of differing sources of the coal, it is often blended on site. 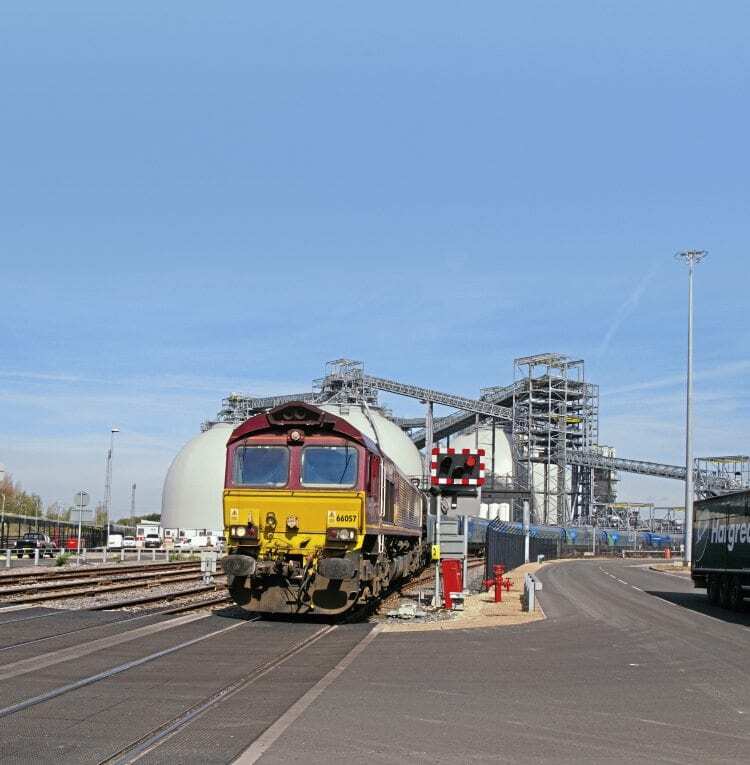 Gypsum, a by-product of the de-sulpherisation process in the coal-fired side of Drax, is despatched by rail to Hotchley Hill (East Leake) or Kirkby Thore (Cumbria). Other by-products are Pulverised Fuel Ash and Furnace Bottom Ash. Quantities of ash are used in the construction industry to make building blocks and other products, while some ash is transported to landfill, an example being the power station’s nearby Barlow Mound, which has been developed into farmland, woodland and wetland features, providing a haven to many species of wildlife and birdlife. 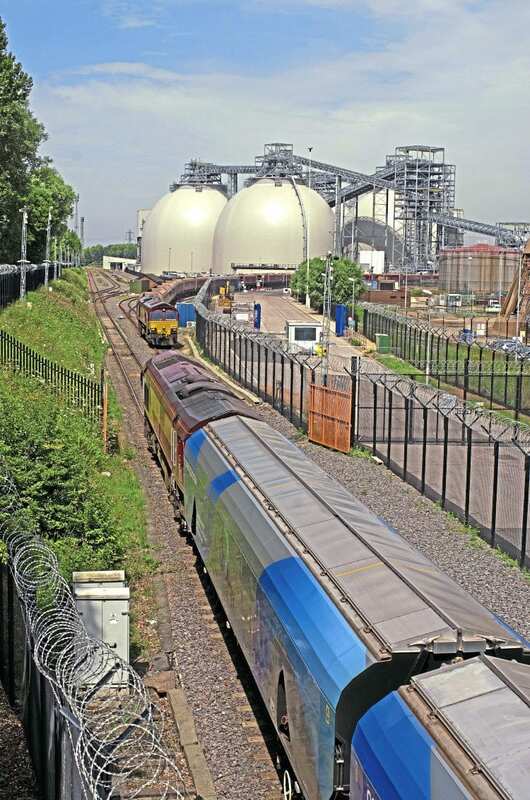 Each train moves around 1,600 tonnes of biomass, so around 25,000 tonnes of biomass is delivered to Drax daily from the three ports, and although the power station would take more, both lack of resources at the port and additional train paths mean there are constraints on deliveries. The lack of paths could get worse as demand increases to run more frequent passenger services across the Pennines, the alternative being longer, less direct routes or other freight operators being forced to relinquish paths that are dormant, and have been for some time. On arrival at the power station, the incoming biomass trains are routed over one of two biomass unloading roads. At a speed of ½mph, the biomass drops onto conveyors and the bulk load of wooden pellets is carried into the storage dome. En route to the dome, there is a process where any foreign objects that won’t combust are filtered out of the biomass flow. Drax has four domes – 55 metres high and 65 metres wide – that are visible from the main rail access point. They were the largest project of its type in the UK, some 30% larger than the Royal Albert Hall. Each dome holds 75-80,000 tonnes of biomass, and are weatherproof and gas tight. This is because biomass is a volatile commodity, and while in store nitrogen gas is pumped into the domes to eliminate the fire risk. When being moved by rail no such facility is possible, but the risks are much smaller. The domes also have vents at the top that can be opened to relieve pressure should it build up. With each boiler consuming around 8,000 tonnes of biomass every day, there is always 10-12 days’ supply on site, as well as further product in hoppers at the ports, which is why the supply chain can be so critical. The pellets are moved by conveyor from the domes to a ‘day silo’, which has around three hours supply, before a more localised hopper is used, where the product is ground to a fine dust in a crusher filled with 10 one-tonne steel balls, before being blown into the furnaces. Steam from the boilers is fed to six turbines in the turbine hall, one of the few non-photography areas I encountered, each turbine spinning at 3,000rpm to create electricity that is routed to the national grid. Each turbine is overseen by one of six control desks that monitor supply and output. 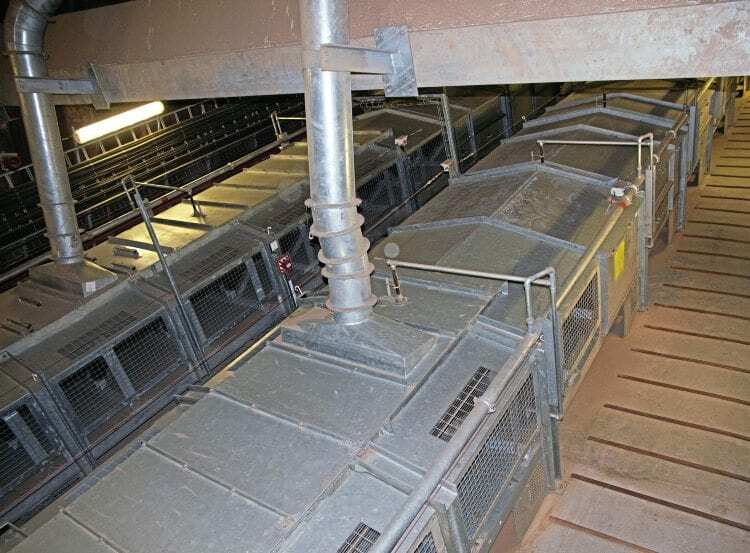 As well as the product, the dust is volatile too, and steps are taken using vibration and a complex ventilation system to minimise problems. Staff who work near or have to access the unloading or conveyor areas must wear a breathing mask that covers nose and mouth as well as gloves and eye protection. Because the thermal efficiency of biomass is lower than coal, each boiler burns more of the pellets, but the cost ratio is lower as are the CO2 emissions. Having made the move to burn biomass, Drax took the decision to have special wagons designed. While the converted coal wagons initially used by GBRf worked well, there was a view that more product could be transported for no extra cost. Working with Lloyds Register Rail (now Ricardo Rail) and Network Rail, a design for a new type of wagon was pushed forward, first being unveiled at the NRM in July 2013. The prototype was made by W H Davis, of Shirebrook, which has since completed orders for a total of 225 wagons, split into nine 25-wagon rakes. Coded IIA under Tops, the wagon body is made of stainless steel, the designers managing to increase the capacity over the converted coal wagons by 30%, giving it a payload of just under 72 tonnes, while remaining within the loading gauge. Each wagon is 18.9 metres long. The bottom doors measure 3.7m and discharge is controlled by lineside magnets. The wagon is technically advanced too, with unique door designs and a patented product flow control system to manage the biomass during discharge. By using rail, an estimated 270,000 lorry journeys each year are eliminated. With the Government signifying the end of coal-fired power stations by 2025, Drax is well placed to convert a fourth unit to biomass, perhaps even a fifth, but still needs to address concerns relating to product quality, global warming and managing disruption to shipping flows. If a fourth boiler was converted, more biomass wagons would also be needed, and then there may also be demand from GBRf or DB Cargo for faster freight paths. ■ Thanks to Jennifer Davies and the team at Drax for their help in the preparation of this feature.